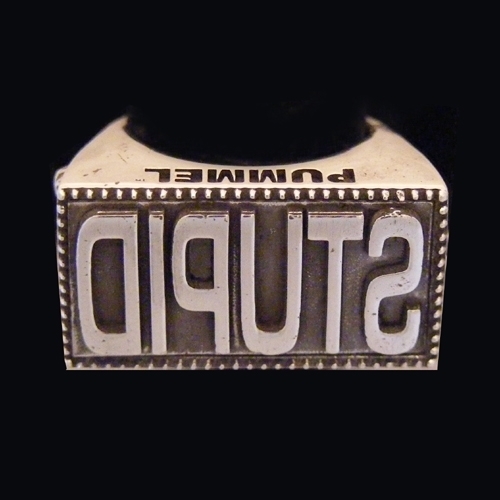 26.4 mm wide x 14 mm high rectangular ring top with the word STUPID spelled backwards. The shank tapers down to 6.6 mm in the back. Sterling silver. Design Notes: I came up with this idea late one night, a couple of days before our first tradeshow. The are called Pummel Rings, Jewelry that Packs a Whallop! On the one side of the shank is a skeleton climbing through a hole, on the other side is the skeletons feet going through the hole.